Syracuse Symposium, whose theme this fall is “Memory-Media-Archive,” continues with a presentation on the social significance of traditional material culture. Marsha MacDowell, professor of art and art history at Michigan State University, will speak on “Piercing Peace: Quilts As Visual Discourse of Conflict, Reconciliation and Memory” on Monday, Oct. 22, at 7:30 p.m. in Maxwell Auditorium. The event is free and open to the public. For more information, call 315-443-5708 or visit syracusehumanities.org. The event is organized and presented by The Syracuse University Humanities Center for The College of Arts and Sciences and the campus community. Co-sponsors are the Hendricks Chapel Quilters and the Department of Anthropology. MacDowell’s presentation will cover the production, meaning and use of traditional material culture, particularly among Asian Americans, Native Americans, South Africans and women. 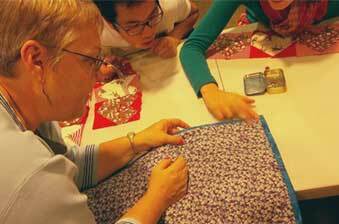 In particular, she will examine the social impact of quilting, a sewing method done to join two or more layers of material together to create thick padded material. MacDowell is founding editor of the H-Quilts online discussion forum, a founding board member of The Alliance for American Quilts, past president of The American Quilt Study Group, coordinator of the Michigan Traditional Arts Program (a statewide partnership between the MSU Museum and Michigan Council for Arts and Cultural Affairs), a founding faculty member of the Museum Studies Program at MSU, executive board member of the American Folklore Society and a member of the editorial board of the international journal Museum Anthropology. Her current research projects include South Africa quilt-making; historical and contemporary Great Lakes Native quilting, quillwork and basket-making traditions; the impact of the 1930s-era “The Detroit News Quilt Show” and WWJ radio quilt show on quilt-making in Michigan; the history and meaning of Michigan community history quilts; the development of Native basket-making organizations in the United States; the late 20th-century quilt revival in the United States.